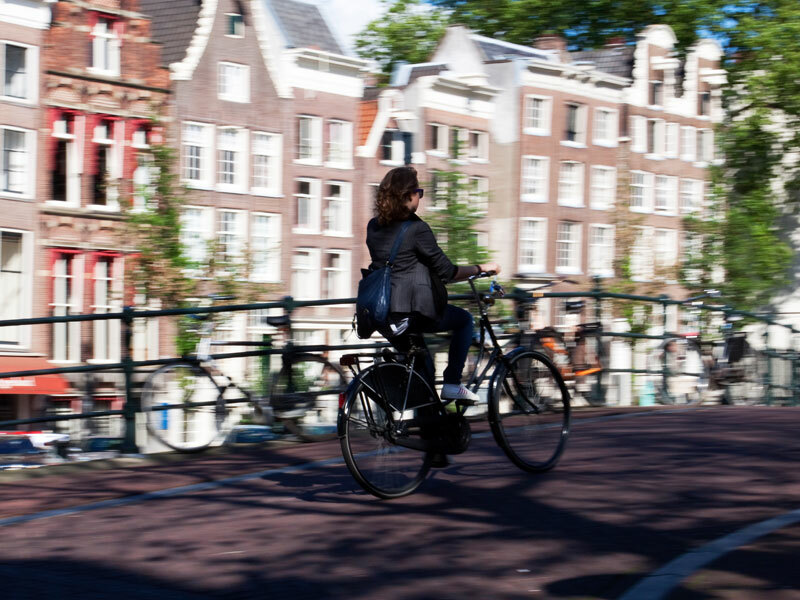 In addition to being one of the most bike-friendly places in Europe, the Netherlands is about to make their bike lanes even more green — by paving them with solar panels. The initiative is part of a larger plan to pave all of their roads with solar panels but the Dutch have elected to start the experiment with two-wheeled transportation lanes. The technology is called SolaRoad and was developed by the Dutch firm TNO. The actual make-up of the SolaRoad is a layer-cake of sturdiness and energy. They start with a layer of concrete, then place over that a centimeter of silicon solar cells and then finish it all off with a layer of strengthened glass. It is estimated that the Dutch road network is comprised of 85,000 miles of roadway with the potential for generating 54 kWh per square yard. Each SolaRoad panel is comprised of a 1.5 yard by 2.5 yard layer cake — concrete, solar cells, thick glass — and the Dutch plan to start their installations next year in bike paths in the small town of Krommenie, which is near Amsterdam. TNO is working with the government on this pilot program and hopes to expand after testing the SolaRoad in Krommenie. The energy produced from the road can be hooked up to the grid and will be used to power streetlights, stoplights, businesses and homes. kWh is a unit of energy. If the time span over which this is generated was provided than this would be useful information. In the current context it is meaningless. Get you science right. This is complete nonsence and to waste the taxes we pay. It would rather be publicity and economically wise to generate solar power in the sahara desert and transport Holand than this project. After all we just want to spend money on solar energy damn the cost/benefit analysis. I've never ever understood the solar roads movement. I know that roads represent a lot of area that humans regularly maintain (rip up and rebuild) and a lot of square footage that sun falls on but seriously... when you think of where solar cells are best placed, the absolute best place is high altitude very dry and uneventful deserts. Lots of sun, lack of clouds, minimal atmospheric interruption and *no one riding bikes on them*. There's a whole world of abuse on roads of any kind that solar panels aren't supposed to be a part of. This makes roads incredibly expensive and solar panels incredibly inefficient. I can't stand that people with money are dumb enough to invest in projects like this. And 54 kWh per square YARD!? First of all that will never ever happen and second, did who ever came up with that metric ever pass any high school science class? Kilowatts per hour... yards... facepalm. When solar power became the next big thing in germany, i heard quite often that covering all the roofs in our country would be enough to generate the energy we need (given that there are storage solutions to catch the energy that is too much to give it back at night or rainy days etc) Having that in mind i have to agree with Milieunet that it is complete nonsense to pave roads with solar panels. Why? 1) Only Bikes and other "light" vehicles can drive on those roads. That means that trucks are out of the question and i don't think that normal cars with 1 ton and more (which is normal these days) are good either. 2) Dirt, leafs, snow, quite everything can cover the panels, lowering their efficiency. 3) A lot of trees and houses will likely be in the way of the sun light to reach the panels. 4) Everything that drives, rides and walks on those panels hurts the efficiency. 5) Scratching the surface will be a very big problem because the "strengthened glass" (everything from glass+plastic combos to very expensive gorilla glass) is going to cost a lot if you have to replace it. That lowers the efficiency indirectly. In the end this isn't about helping the climate or anything but just a publicity stunt. Having an average efficiency of 10% in mid-europe is bad enough for photovoltaic energy-generation, but i doubt that this solar road will get anything more than 2% counting in the bad orientation of the panels regarding the sun and the fact that you need a layer of expensive glass on top which is likely to increase the overall costs if (or probably when) you need to replace it. I was going to say what gearsofrandy said. I can't help thinking this would be terribly dangerous for cyclists. (And I am one.) I also agree with Milieunet's criticism. If this project's purpose is exploratory, a la minus_wit_humor, then the writer should have said so. She also should have addressed the danger of riding on an incredibly smooth surface. I'm not impressed. Wouldn't that be slippery in the rain? Metal grates and the like are treacherous when even slightly wet, glass seems like it would be more so. Milieunet, I can certainly see what you're saying, and you're not wrong. However, I think there's value in projects like this that go beyond simply generating power. In my opinion, we are just starting to scratch the surface with how solar power can be woven into our cities and infrastructure. You're right in that there's much cheaper solar solutions out there, and I might be wrong about this, but it would seem that the point of the project is to highlight the potential of solar rather than its practical application. 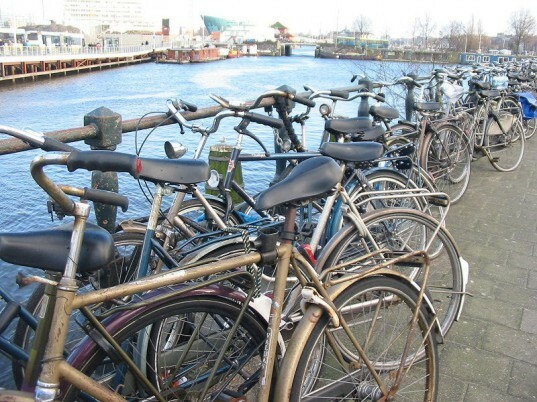 In addition to being one of the most bike-friendly places in Europe, the Netherlands is about to make their bike lanes even more green -- by paving them with solar panels. The initiative is part of a larger plan to pave all of their roads with solar panels but the Dutch have elected to start the experiment with two-wheeled transportation lanes. The technology is called SolaRoad and was developed by the Dutch firm TNO.